Tsubaki Oil is a Japanese beauty dry oil that people have been using for many years. It could be used in treating dryness, aging, and also aid in damage caused by sun exposure and pollution. 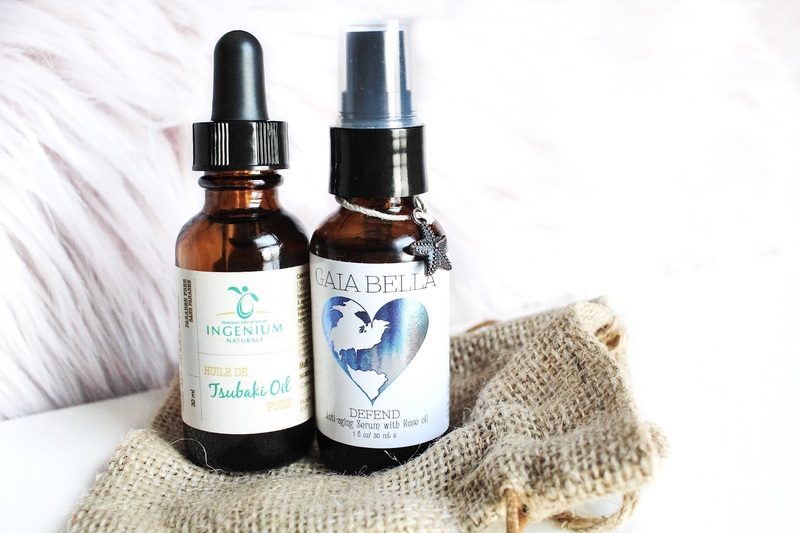 After doing some reading on their website, I found that this oil is in it's purest and virtuous form; meaning that it's not mixed in with other ingredients, so you get the full effect of the natural Tsubaki Oil. I apply this oil last, after my moisturizer is on. What I like to do is rub 2 or 3 drops in the palm of my hands, then massage it into my skin for a couple of minutes. One thing I always like to do during my skincare routine is massage my face as it gets all the blood circulating better and I find that during applying my oils is when it works the best. I find that this oil doesn't look super oily on my skin, but instead gives it a nice dewy glow. After using this for the past few weeks, I found that my skin was less dry (as it gets like that during the colder months). I don't think my skin has shown any signs of aging yet, so I can't speak on that claim, but if the Japanese people have been using this oil for years, I trust that it probably lives up to that claim. Like they say: Asian don't raisin! - maybe this was the secret to that. First of all, could we appreciate the packaging of this lovely bit?! I absolutely love the little logo, it comes with a pump, it also has it's own little necklace with a starfish, and to top it all off, it came in that cute burlap sack - 10/10 for presentation! As for it's claims, it's supposed to give you ultimate hydration, balanced sebum protection, enhanced skin tone and smoother texture, reduced redness/dark circles/spots/scars, smoother fine lines and wrinkles, and offer protection for your delicate skin. Wow, those are a lot of claims. I find that this one is much more oiler compared to the Tsubaki oil, so I have to be really light handed with this as a little bit goes a long way. Despite that, it doesn't feel too greasy on the skin and, just like the other oil, it gives my skin a nice dewy look. My skin gets a lot of hydration from this & I notice that the look of my skin is much more healthier-looking and it feels amazingly smooth. I have a bit of redness and discolouration on my cheeks left from teen acne & I could see that this oil is slowly clearing my skin from that. One thing I really love about Gaia Bella is that it's a small business. There's a saying that goes "When you support a small business, you're supporting a dream" and that's why I was really excited to find this brand. Their products are handmade, 100% vegan, cruelty-free, and the ingredients are all plant-based & organically certified. If you want to try the Defence serum, you could actually save 10% off your purchase with the code 'GLAMSURGE' (no, I do NOT get money off this code). Do you have any face oil recommendations?